Customers everywhere love choice. And when you sell online, giving shoppers choice means making sure they can find what you have to sell, and making it easy for them to compare and contrast different product or service options. Site search can be one of the most useful tools in your ecommerce toolbox for helping website visitors browse products and information quickly and easily, and view search results in ways that best fit their needs. With a user-friendly site search experience, visitors are more likely to convert, and more likely to return to your site for more purchases. Here are some ideas, taken from our Big Book of Site Search Tips, to help you create an engaging and user-friendly site search experience that can more easily attract visitors to the products they want to buy. Retailers creating compelling content like videos and blog posts, who are also building a presence on social networks, need to display this content so that visitors can easily find it within search results. For example, by adding tabs to search results or showing different types of content on different parts of the screen, this non-product content is highly visible to visitors. It’s a good idea to display search suggestions on the search results page. Search suggestions are terms related to the term typed in the search box, and can give visitors more ideas for what to search for. Show these suggestions at the top of the page and at the bottom of the page below the search results. Adding these suggestions can encourage visitors to view more product: according to our research, about 25% of site visitors will click on a search suggestion. 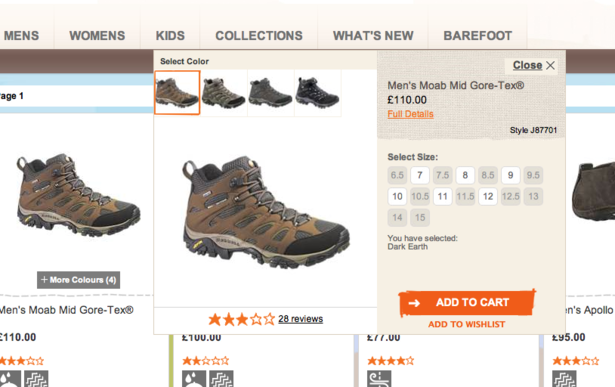 Grid views are useful for product searches that generate many results. Depending on the size of product images, you can display three, four, or five images across the page, which means you can show many more products above the fold. On the other hand, using a list view, you can provide more in-depth descriptions of products, along with shipping costs and product ratings. If you allow visitors to choose which format they prefer, they will enjoy having the flexibility in how results are displayed. Many advanced search engines can sort results by multiple criteria. For instance, visitors may wish to sort results by price, most recent, brand, star rating, alphabetical order, or other criteria. In addition, your social network-savvy visitors may want to see items with the highest number of Facebook likes or Pinterest pins first. Visitors gain the ability to see more product information without leaving the search page if you add a Quick View button that opens a product detail window. These windows remove the need for visitors to load the entire product page, and help them narrow down their product choices faster. Quick View buttons can appear when shoppers hover over product images on search pages, or you can place them below product images so they are always visible. Shoppers want to know if a product is available before they go through checkout, so adding stock or inventory information to search results is a big help. Include an icon that says something like “In Stock” or “Out of Stock” in search results next to each item. Shoppers can then easily find other items to purchase if their first choice is out of stock, and they’ll be less frustrated and more likely to remain on your site. Your search engine can also display only items that are in stock, or give a higher rank to those that are in stock. When you offer these user-friendly features within site search, you can help customers find items they’re looking for in a more streamlined way – but you also place visitors in control of their own shopping experience, which always helps increase customer loyalty. With mobile internet usage skyrocketing, and more and more publishers investing in developing mobile experiences, it’s no surprise that expectations for mobile advertising are high. As a great end of the year Google Hangout, join us December 13, 2012 at 12:30 EST as we discuss cutting-edge data techniques for supercharging advertising used by global corporations for marketing as released in the latest Econsultancy report “Best Practices in Data Management.” Data Management Platforms (DMPs) and Audience Management Platforms (AMPs) are all the rage, but getting the most out of data for audience segmentation, insights, and targeting takes more than just a relationship with a vendor. The mobile train has left the station: Are you on board? There are a few times when we realize that a certain technology is going to change everything about our lives: the first time we used a cell phone, received an email, searched the Internet or downloaded a song. This past Black Friday was the day we realized that mobile shopping would have just that sort of impact. On Black Friday 2012, one out of every four dollars spent online at retail websites came from a mobile device. This amounts to more than $300 million dollars in one day alone. For those retailers who’ve already embraced mobile, it was a day of celebration, a culmination of their hard work and foresight. For retailers who didn’t get their share of this new mobile world, it’s a wake-up call: Get with the mobile program, or have consumers leave you behind.